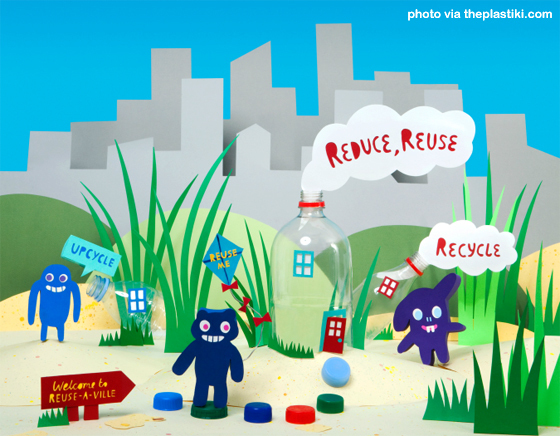 Today we highlight innovators that draw attention to plastic pollution. While taking action against pollution, these amazing creations educate us that waste can be used as a useful resource through design and construction. When you recycle plastic bottles the plastic can be reused and made into custom reusable bags. 1) The Plastiki – A catamaran made out of 12,500 plastic bottles and other recycled plastic and waste products. A boat made of plastic bottles arrives in Sydeney from San Francisco after nearly four months in sea. The crew is drawing attention to ocean pollution due to plastic waste. With walls made of plastic bottles, cow dung plastering interiors, roofs of bamboos and straws and pipes for ventilators, the Aman Setu Primary School on the outskirts of Pune in Wagholi is a school literally made out of waste materials of all kinds. Tzu Chi Foundation recycles plastic bottles to produce textiles for use in disaster relief materials such as blankets and clothing. In April 2011 Stowford Primary School constructed an Eco-friendly greenhouse made from 1500 plastic bottles collected by the pupils and staff. Learn more about our company at FactoryDirectPromos.com and connect with us on Facebook and Twitter. How to Make Your Brand Or Business Memorable? I LOVED THESE VIDEOS! It’s amaziing to see creative ways trash is being turned into treasure these days. Thank you for sharing it was very inspiring. I totally agree! Very interesting ideas, and fantastic to see the end results. It’s hard to imagine that these are made up of waste material! I’m so glad to see the many ways to recycle. I hope that more is published on this. (It gives me hope and ideas. Thank you. We must reuse and recycle!